From our name, you may think we are just a trucking company, but Caravan Pacific Trucking Ltd. has actually been serving Vancouver Island's excavation and landscaping needs since 2007. All of our equipment is of the highest quality and well maintained, so that we can be available when you need us. Big or small, our equipment will be able to access your site and get the job done. We provide a very broad range of services, ranging from residential and commercial landscaping to home perimeter drain system repairs. We also design and install fully certified onsite waste water systems. If you are building a new home, we can help you with any of your excavation or site preparation needs. 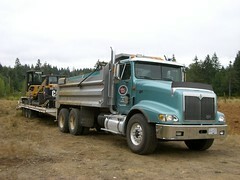 Copyright © Caravan Pacific Trucking Ltd. All Rights Reserved.